Trade shows can be powerful networking opportunities for industrial and B2B professionals, but it’s an exhausting matter to connect and engage with people that you may never hear from again. It’s easy to stand at your booth and hand out your business card and brochure, but who isn’t already doing that? Yours is simply one of several hundred brochures competing for attention, and chances are that your brochures will end up, unread, and thrown out when it comes time to hop on a plane and head home. It’s important to make yourself stand out from the rest; try thinking of things that will grab the attention of people who visit your booth. Think outside of the box. JADCO Manufacturing, a wear steel manufacturer in western Pennsylvania, is ditching their traditional product brochures this year in favor of collectable, branded poker chips while at an industry trade show in Las Vegas, Nevada. This unique item will travel home with most people as a collectable souvenir, and prompts the recipient to visit a specialized landing page on JADCO’s website, allowing them to opt-in and download a PDF brochure. Rather than simply sending visitors to your homepage, it’s important to use a specialized link that leads them to a targeted landing page. With this stripped down, focused page, you can do things like provide special offers and post a personalized thank-you video. It’s imperative that the page is built with one strategic goal in mind, with a clear and concise call to action. A page that isn’t focused doesn’t convert well, and that loses you money in the end. In addition to simplicity, the success of a landing page comes down to the quality of the offer and the effectiveness of the call to action (CTA). If both of these aren’t present, you will find that people aren’t interested enough to exchange contact information, or that they weren’t prompted well enough to take a targeted action. Either way, you’re losing out on quality leads, and your overall conversion rate is taking a hit. If you have something special to offer to your visitors, ask for some contact information in exchange. By gaining their information, you can measure the overall trade show interest in your product, and you can continue to engage with those folks after they have claimed your offer. It’s important to get inside of your target persona’s mindset and to offer content that is valuable enough to warrant an exchange of their valuable information. When it comes time to pick up the phone and call a lead, you already know that they visited with you at the trade show and were interested enough to request more information. You can call knowing that they are qualified to purchase your product or service, and may have some questions that they would like to have answered. At trade shows, it’s easy to succum to networking overload. However, if you can sort through the people you meet and qualify your leads based on mutual interest, it will save you valuable time and reduce your overall cost per lead. 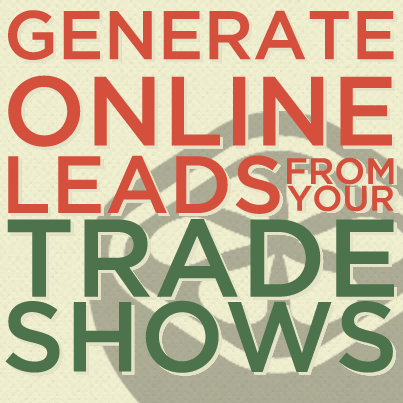 With a basic understanding of how to generate online leads at a trade show, you will find that you are more focused, and your efforts more effective, when attending your next industry event.